Steven (Chicagoland, United States) on 12 May 2011 in Art & Design and Portfolio. The Smith Museum of Stained Glass Windows is a permanent display of 150 stained glass windows housed in an 800-ft.-long series of galleries along the lower level terraces of Festival Hall at Navy Pier in Chicago. Open since February 2000, it is the first museum in the United States dedicated solely to stained glass windows. It showcases both secular and religious windows and is divided by artistic theme into four categories: Victorian, Prairie, Modern and Contemporary. All of the windows were designed by prominent local, national and European studios and most were originally installed in Chicago area residential, commercial and religious buildings. The windows provide unique insight into Chicago's cultural, ethnic and artistic history. The time period they represent, 1870 to the present, was an era of intense urban revision that featured the development, decline and revitalization of neighborhoods, the development of commercial and cultural institutions, the evolution of artistic styles and the response of various ethnic groups to these changes. The religious windows reveal the national and ethnic styles of Chicago's European immigrants, while the residential windows display the history of architecture and decorative art styles. 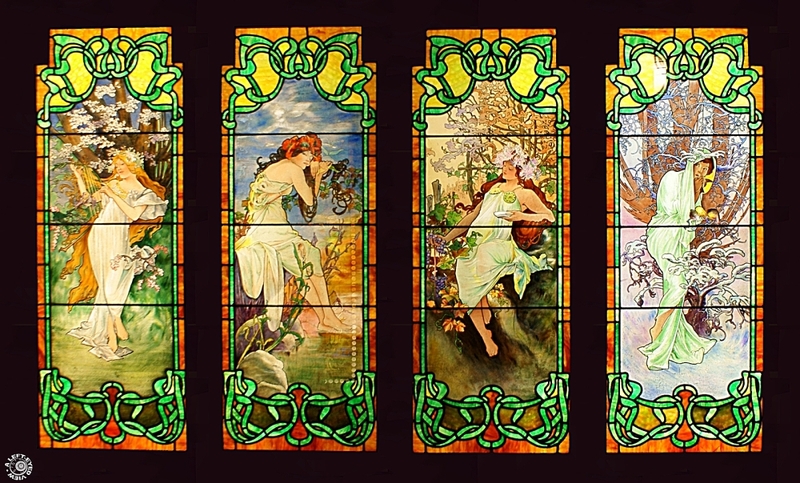 It is believed that Czech artist Alphonse Mucha designed the panels above known as the Four Seasons with the panels Spring, Summer, Autumn, and Winter from left to right. Alphonse Mucha was born in 1860 in Ivancice, Moravia, which is near the city of Brno in the modern Czech Republic. Though Mucha is supposed to have started drawing before he was walking, his early years were spent as a choirboy and amateur musician. It wasn't until he finished high school (needing two extra years to accomplish that onerous task) that he came to realize that living people were responsible for some of the art he admired in the local churches. That epiphany made him determined to become a painter, despite his father's efforts in securing him "respectable" employment as a clerk in the local court. Photo captured March 12, 2011. Sounds like a prize exhibition and you did a fine job with the image here. I'm imagining that those are close to the 'true' early-1900's colors and you were right not to 'correct' the yellow cast. An unusual subject for you Steve, I love the colours too, which remain true to the artistic fashion of the day. These panels are glorious - beautifully captured too. Very interesting background story as well. Gorgeous capture - the detail is superb! These paintings are fantastic and so sharp and clear...the view is perfect thanks to your skills and framing...This is just magnificent. I am glad he did not become a court clerk like his father wanted...who says "Fathers Know Best" ?? I would love to visit this museum some day. Stained glass is so beautiful. This piece is amazing. i love this bright capture with all that details on it! That is beautiful and elaborate glass. A treasure for the museum. A gorgeous series of panels. I'm glad he stuck with art. Realy nice glow you managed with here. It is a successful church window feeling. I hope you get a spotlight for this, its perfect!